On June 24th, the Canadian Coast Guard made an unexpected discovery. Drifting near the mouth of Bamfield Inlet was the carcass of a harbor porpoise that appeared to have been entangled in a gillnet. 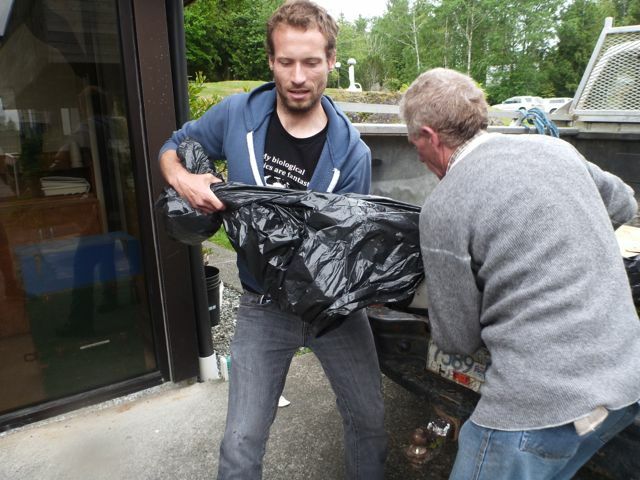 The CCG contacted the Bamfield Marine Sciences Centre to take posession of the animal until the Department of Fisheries and Oceans came to collect it for a necropsy. I was lucky enough to be at the dock when the animal was first brought in and had a chance to see first hand a creature that I had only seen from a great distance. It appeared to be an adult, measuring about 1.5 meters from tip to tail, but when I picked it up to help carry it up to thelabs it was much heavier than I expected (at LEAST 30kg). Carrying the porpoise to the labs. Once we had it inside, we were able to take a closer look at the porpoise. There were various thin scrapes that looked like wire mesh, and several larger wounds it has sustained. From here we were able to make space in the freezer while DFO was contacted to arrange collection. Porpoise in the sea table. Tail fin. In the meantime, we were able to share the animal with several of the University Programs running at the station as a part of their educational curricula. 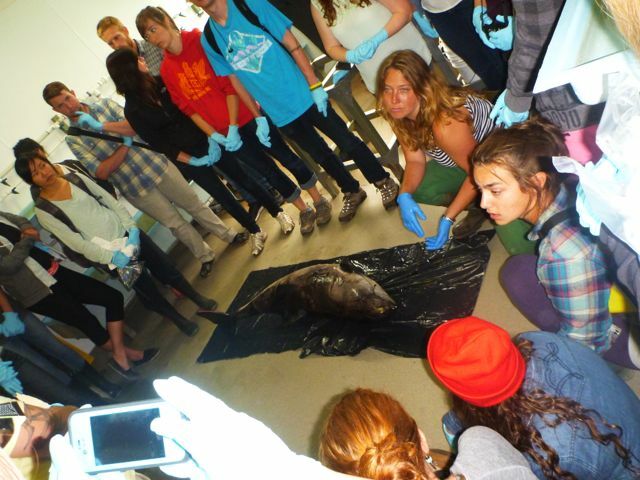 Many students attended for a look at the animal, as well as pictures of its recovery. All in all, it was a great experience for them (and me) to see this elusive animal close up. 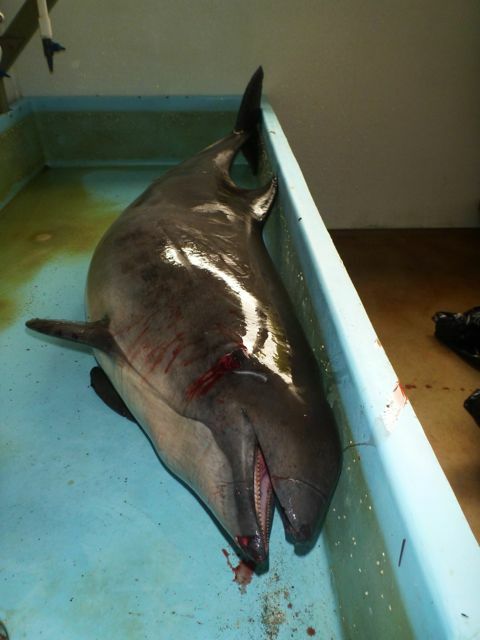 While the death of this porpoise was a very unfortunate occurence, turning it into an educational tool made the most out of the event. 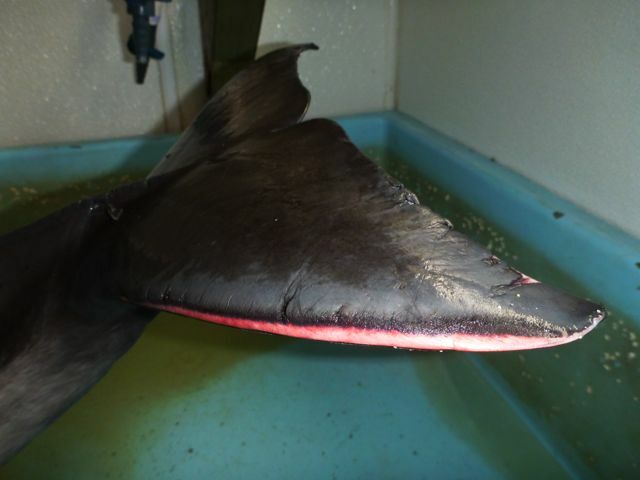 It also raises many questions about bycatch, and technological tools that can minimize unwanted capture of marine mammals and other non-target species. Sharing the porpoise with university students. Several weeks back, researcher Brett Favaro lectured at BMSC on just that subject. He presented a meta-analysis of various technological bycatch deterrents that suggested there is no "magic bullet" for reducing bycatch, and that some methods involve tradeoffs, while others aren't worth the high price. In the end it seems to be a game of trial and error, environmental politics, and technological advance that will hopefully mitigate the more damaging aspects of gillnet fishery practices. Who knows, with time maybe someone will find the "magic bullet" that will effectively eliminate bycatch without reducing target catch. I set out with a group of staff and researchers from the Bamfield Marine Sciences Centre who were looking for some subtidal adventure. We boarded the Broken Island Adventures' diving vessel, the 'Grunt Sculpin', and set out for a pinnacle in the middle of Imperial Eagle Channel. This is an extremely exposed site, where a rocky mount rises up from around 100m depth to just 5m below the surface of the water. In fact, it took us a little time to even locate the site, using the boat's anchor as a depth sounder. Once in the water, we slowly followed the anchor line down and encountered some of the better visibility I've ever seen in Barkley Sound. I could see at least 15m across the pinnacle, and when you're used to only seeing about 3m away, this is a vast improvement. The pinnacle itself was very rugged, covered in plumose anemones and more rockfish than I've ever seen in one place. China rockfish, tiger rockfish, and black rockfish were around every turn, but the best was yet to come. The giant pacific octopus and the wolf eel are somewhat in competition with each other in nature. The both like to use the same sorts of small rocky caverns as dens and have been seen 'duking it out' to obtain the choicest resting place. The wolf eels use the dens as protection, the octopus also use them to lay their eggs. If you see an octopus under the rocks with what look like long strings of rice hanging from the ceiling, you've just encountered an octopus mother watching after her young. Imagine yourself perched above the intertidal, kelp below slowly bobbing in the gentle waves when suddenly you see an enormous form floating around the corner. At first you think it might be a capsized boat, until you realize that itâs moving with purpose. A porpoise, then? A huge seal or a small whale? The creature slides slowly through the water and approaches the shore. You can barely believe your eyes as the enormous animal heads for the nearest rock and pulls its bulk partially out of the water with small front flippers. Its black skin shines in the sunlight as it absentmindedly chews a tangled blade of kelp. You have just been fortunate enough to glimpse Hydrodamalis gigas or, Stellerâs Sea Cow. Unfortunately such a scenario is all but impossible in modern times as the last known Stellerâs Sea Cows became extinct in 1768, a mere 27 years after their âdiscoveryâ in the Commander Islands by a group of European explorers. At their peak, the Sea Cows inhabited a range from California to Japan and represented a major consumer of intertidal algae. Nearly 8 meters when fully grown and up to 10 tons they positively dwarfed their closest relatives the manatee and dugong. These giants represented the largest sea mammal besides whales to occupy Northwest waters. Of course the Sea Cows of the Salish Sea disappeared long before the last of their kind was encountered in the Commanders by Europeans, though they did suffer a very similar fate. lastpopulation in the Commanders was quickly decimated by expedition ships which hunted the animals as an easily accessible and long-lasting food source. Historic populations most likely also fell prey to over-exploitation. As with most of the megafauna of the Pleistocene and Holocene, Stellerâs Sea Cow went the way of the Mammoth, though it did enjoy an unusually longer stint compared to most of its megafaunal contemporaries. 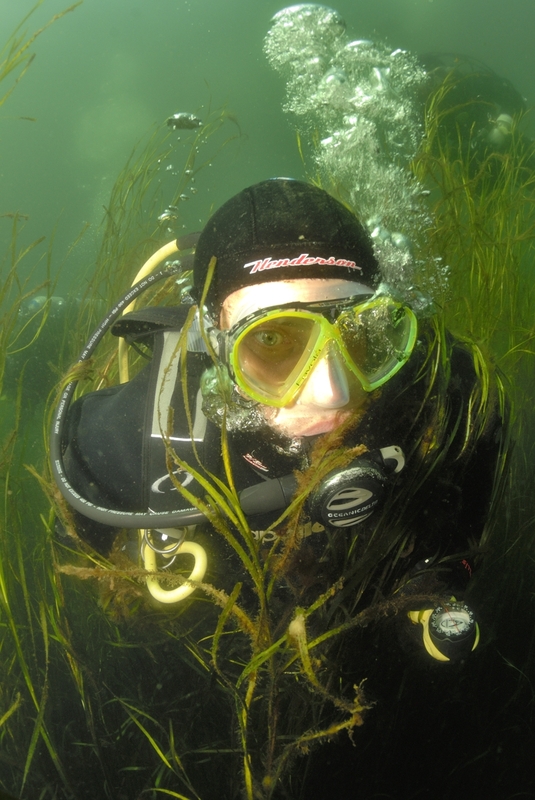 This week nature photographer Reinhard Mink is visiting the Bamfield Marine Sciences Centre to learn more about eelgrass habitats and the various threats they face. He joined my lab for a dive in a nearby eelgrass meadow to get a first hand look at the fish and invertebrate species common to BC eelgrass, and to observe our field research in action. You can see his impressions (in German) from our first encounter on his blog. Reinhard (or "Reini") has taken photos for various magazines including Atlantis, and has recently worked with the student expedition organization Wilderness International. His underwater photography is particularly stunning and I look forward to showing him more of what BC eelgrass meadows have to offer. He is also quite an impressive diver. While recovering the temperature logger we set out to collect, I barely even noticed that he was there. He was able to snap a candid shot of me (do I always look like I have 'panicked diver eyes'?) that is featured on his blog as we searched for the equipment amidst the dense eelgrass. Our next excursion will be later this week, when Reini will join us for our final round of eelgrass sampling for the summer. Hopefully we'll be able to provide him with more critters and underwater model-poses. Enjoy the best of beautiful Barkley Sound, BC, and the Bamfield Marine Sciences Centre! The Wolf Eel Welcomes You! 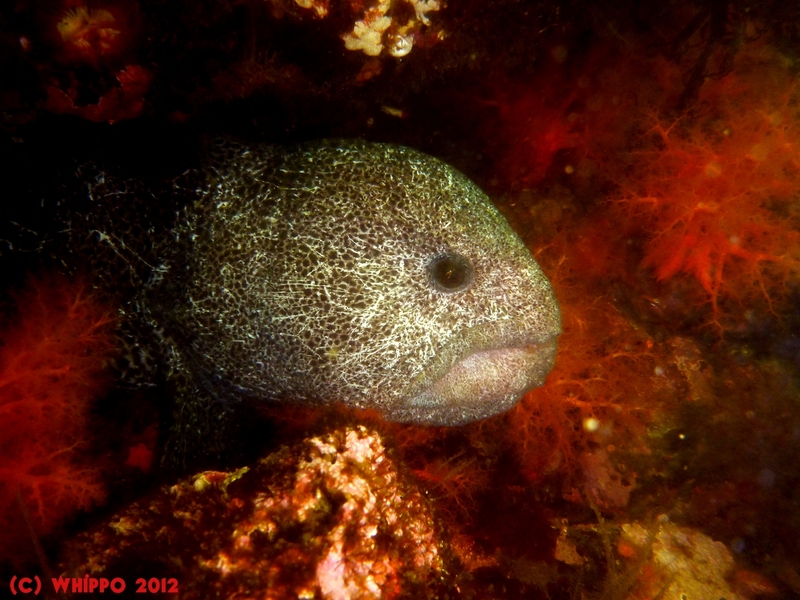 The mighty wolf eel (Anarrhichthys ocellatus) would like to welcome you to my blog! I spotted this beauty hiding under an overhang in Scott's Bay near Bamfield, BC just waiting for his chance to show off for the camera. And while my buddy and I didin't find the critter we were actually looking for (the sea slug Hermissenda crassicornis), we did catch a glimpse of many other amazing creatures like this wolf eel. Sea cucumbers, brittle stars, and abalone reigned just under the surface of the water! Stay tuned for more photos and tales of Barkley Sound where I am spending my summer working from the Bamfield Marine Sciences Centre. I hope to bring the excitement of the Pacific Northwest marine environment right to your doorstep!